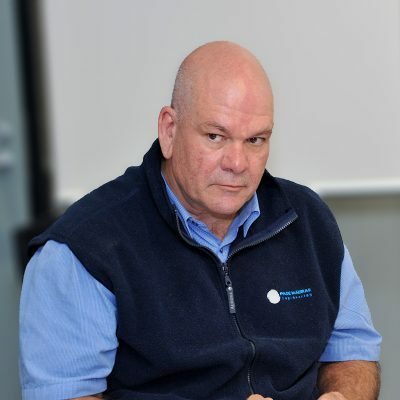 As General Manager I bring over 30 years’ experience in manufacturing, chemical process and energy to my role. Reporting directly to Page Macrae Engineering’s board, I’m responsible for leading our senior management team in developing strategy and meeting company objectives. One of our primary focuses being the development of engineered products and solutions for the global export market, which now represents a substantial part of our business. Privately owned since 1955, Page Macrae is one of the largest heavy engineering company’s in New Zealand. Approximately 20% of our revenue is made up of export sales of our own bulk material handling equipment, predominately into Australasia, where we provide solution based products. As our primary market, Australia has our equipment in every major Port – providing an excellent proving ground for us. One example of what we‘ve achieved here, is the development of dust controlled gear specifically targeted at handling dusty bulk products being discharged from ships that impact on the environment. With focus on this problem and success in the field, we’re now considered the industry experts and ‘go to company’ for this equipment. We’ve also achieved sales in South America and Canada – and are actively promoting further growth by carrying out detailed market research in Ports across these regions. I’m honoured to have the opportunity to be part of creating a sustainable future for the NZ metals industry. Being part of the executive board provides an excellent vehicle to achieve this. I strongly believe that by investing in research, training and innovation we will succeed in this vision.